Press 104-Key Keycaps | DREVO :: Game With Cool Tech. December, 2017 - DREVO, a brand keen on powering the global PC gaming community with unprecedented offerings of SSDs and mechanical keyboards, now announces a new accessory - a full set of performance PBT keycaps for users who want to DIY their mechanical keyboards. 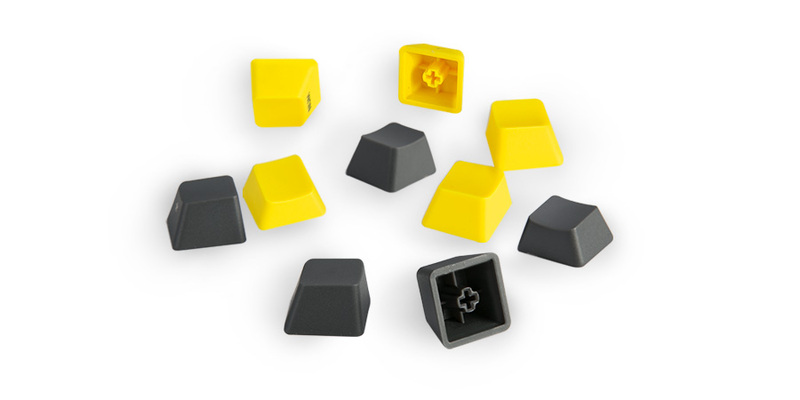 This keycaps kit is of standard profile and has four color schemes. As a DIYer who wants some fresh feelings with your mechanical keyboard, this ANSI US 104-key kit is your wise choice. 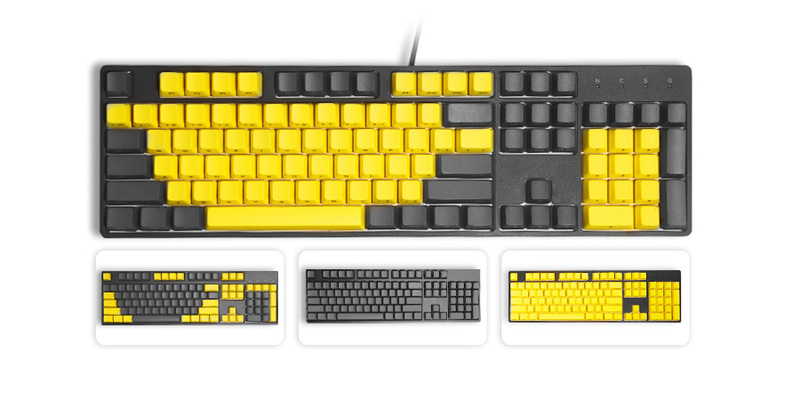 It has four color schemes available by mixing gray and yellow, which helps you achieve an entirely new look of your current keyboard simply in a minute. To ensure a high durability and all legends permanently legible, ultra-durable PBT is chosen with 1.5mm thickness walls. Being a material superior over ABS, PBT never leaves you to be bothered by the shine effects over time. No glossy keys is a pleasant thing! All the legends are printed in the front side through laser marking, which is a distinctive aesthetics feature pursued by people with personality. All DREVO 104-Key keycaps are standard profile and created for Cherry MX switches or one of the numerous MX clones. It’s fully ready for 87-key and 104-key keysets from brands like CoolerMaster, Ducky, IKBC and Filco. So, have a quick check and get it started with the attached key puller!